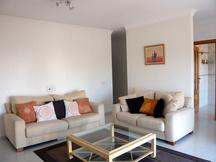 The quinta is set in a valley 10 kms from Tavira, close to golf courses, spas, shops and the motorway. It is set in grounds full of fig, orange, carob and olive trees. There is a communal pool, sauna, games room, massage service, tennis court and bikes to use. Each cottage can sleep 4 people, the bedrooms have air conditioning, the kitchenette has a fridge, mini bar and kettle. There is a TV in the living room. The bathroom has a shower, hairdryer and heated towel rail. There is an open fire for the winter months. The local village is 2kms away and sells almost everything. Tavira has many shops, cafes and restaurants. The nearest beach is approx 10kms drive away. From the airport follow green signs to lisbon out of faro, stay on the dual carraigeway until you see the blue sign for espanha, take this exit and join the A22 until junction 15 signed olhao and santa catarina. Take the last exit on the rounabout to santa catarina, travel for approx 5 kms to the roundabout in santa catarina, take the first exit and the quinta is 2kms on the left. Please quote reference: a4m: 1350 farmhouse "quinta fonte do bispo"